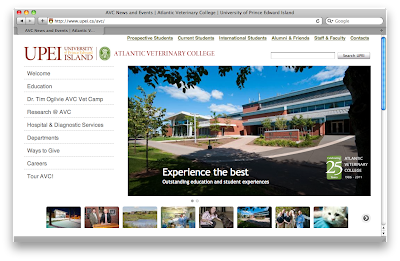 The Atlantic veterinary College web site. Today I thought I would write about something bit more serious than plants and food. The idea came from an article republished in today's Chronicle Herald. It's about a call-in support line for grieving pet owners. The Atlantic Veterinary College (AVC) (http://www.upei.ca/avc/) in Charlottetown, Prince Edward Island is currently celebrating its 25th Anniversary. It is THE place in Atlantic Canada for veterinary education and research. The article today, written by Mary McKay and first published in the Charlottetown Guardian newspaper, is about a new service being offered there staffed by volunteers. It's a service, I personally believe, that is well deserving of our support. The loss of a pet can be very traumatic for the owner and owner's family. Regardless of the species of pet, they do have a way of settling into our hearts so deeply that they are members of our families. We often treat them as furry, scaly, feathered or whatever, children. We love them deeply and in return they give us their love and loyalty. 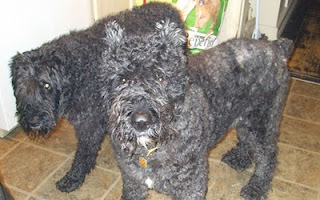 I went through a terrible loss, as you know from previous posts, of my Bouvier Simon in March of 2009. It affected me deeply. He was my little boy and I treated him as such. When he passed away at home from complications of old age it was if all the stars stopped twinkling in the night sky. The sun was less bright, food less interesting and the flowers less beautiful. I essentially became depressed. Even now, over two years since, sometimes just the thought of Simon and how much I love(d) him will bring uncontrollable sobs. Luckily I had someone in my life who loved me and could understand how I felt, even as they were grieving too. But what if you don't have the support of family and friends? The loss of a pet affects everyone differently. Some just pass if off as easily as shaking water from an umbrella. For others it is a tragedy. Losing a pet can be made more difficult for the grieving owners by friends and acquaintances who just don't get the depth of the feeling of loss. It can be, and is for some, as significantly felt as if a parent, friend or human child has passed away. This lack of understanding makes recovering from the grief a longer and harder process. This is where the Atlantic Veterinary College's new service steps in. The AVC Pet Loss Support Line gives callers a sympathetic person to speak to about their feelings. You can talk with them about how you feel, or they will just listen so you can get it all out. They let you know that there are lots of people "out there" who feel as you do, that it is a normal process and you're not alone. When you're grieving this is a service immeasurable in value. And think about it—they're all volunteers. The volunteers get special training in theory of grief and what to expect when people call. They are educated in how to deal with callers and help as best they can, especially in an environment where they are not face to face. Most (if not all – I'm not sure) are students at AVC. Our two boys, late 2008. There is value for them as well in this service as there are no specific courses offered at the college in grief counselling. This gives vet students hands-on experience for what they will inevitably deal with when they graduate and begin their practices.So it is a win-win situation. Having someone to call in times of grief crisis can be a godsend to those of us who are experiencing these sometimes overwhelming feelings. I can only think that the people who volunteer for this must be very, very special indeed. If you need someone to talk to give them a call. There is no toll-free number (yet) but perhaps a pet product company or interested party will step up to the plate and support this worthy cause. If any of my readers have contacts that could assist in the help line's support please feel free to let them know about this wonderful service. So how can you contact them? You can also email them at pethelpline@upei.ca. The beautiful thing is that, as far as I know, they will take calls from anyone, anywhere in the world. I would assume that the only prerequisite would be being able to converse in English. They do make a point of stating that they cannot offer any medical advice, which only makes sense. It's a telephone conversation and also presupposes your pet has passed away. So if you need support dealing with a loss, give the AVC Pet Loss Support Line a call. Even though I had family support in dealing with my grief, I'm sure I would have used this service if I had known it had been in existence. 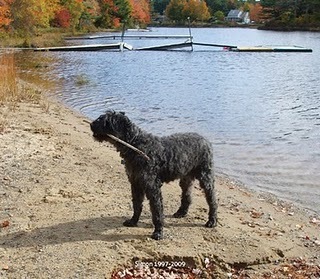 This is a bit morbid, but even though our Bouvier Henry is healthy and still quite young, I can't help but think of the future and what we all will go through when "that time" arrives. I'm glad I now know about these fine gentle folk at the AVC. They definitely deserve our support in this most kind and helpful of endeavours.